Introduce some added convenience to your kitchen with the Progressive International Vegetable Cutter. It is ideal for slicing carrots, celery, peppers, zucchini, greens, cheese and much more. 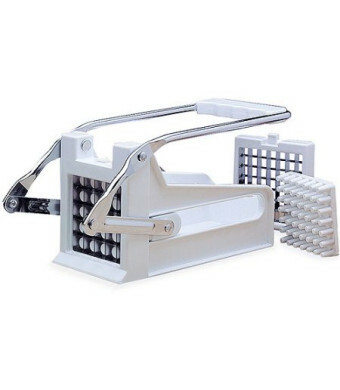 The Progressive vegetable cutter can even be used to quickly and easily slice up potatoes for homemade French fries. It is a handy way to make a delicious vegetable platter at home for dinner or a party. This Progressive potato cutter is easy to use thanks to its simple-to-operate lever action. It slices vegetables evenly and is capable of reducing cutting time by nearly half. The blades are stainless and interchangeable. The cutter features a blade with 25 holes for large, thick slices and one with 49 holes for smaller, thinner cuts. The blades and pusher grid are dishwasher safe. The frame is hand washable. 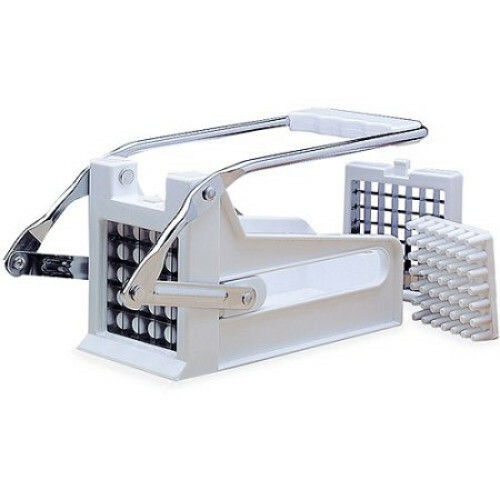 The Progressive International Vegetable Cutter is designed to stay stable and secure on a flat surface while operating.